When I moved to the UK, I wasn't able to carry many of my old faithful, tried-and-true products. My hair, this weather, and the water just do not agree! While searching for an alternative to Shea Moisture Coconut & Hibiscus Moisture Mist, I found Taliah Waajid Protective Mist Bodifier. 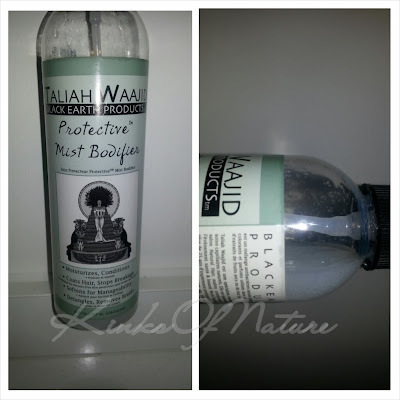 Product Claims: Taliah Waajid Protective Mist Bodifier is a daily leave-in conditioner. The mist bodifier moisturizes, conditions, coats hair, stops breakage, detangles and removes braids and twist styles for more manageable, softer, and healthy hair. The profective mist bodifier coats, protects and softens the curl pattern. The results is easier to comb hair as well as long lasting styles. Ingredients: Deionized Water (Aqua), Wheat germ extract, Aloe Vera (Aloe Barbadensis Leaf, Cetrimonium Bromide, Cetyl Alcohol, DMDM Hydantion, Olive Oil (Olea Europaena), Glycerol-(vegetable derived), Silk Amino Acid, Bay Laurel Extract, Fragrance (Parfum). Thoughts: This is a nice daily moisturizer. Though it's a liquid, it performs better than some cream moisturizers I've used in the past. I was hesitant to buy this, but I remembered my sister liked it in the past. It has a thick consistency, even though it's in a spray bottle. It's almost as thick as Hawaiian Silky 14-in-1. If it's too close while spraying, there'll just be a white glob instead of a 'mist'. Nevertheless, it works! It moisturizes and softens. The Mist does add a bit of slip, but I won't be attempting to detangle with it. It does somewhat coat the hair and will buildup after a few applications. When I do buns, I use this underneath gel. Around day 5, the buildup becomes noticeable if I continuously apply the gel directly on top of the Mist. To avoid the unsightly dreaded white balls, I'll use the spray at night and gel in the morning, allowing enough time for the Mist to dry. I've also used it to refresh wash-and-go's by applying to my hands and scrunching product into my hair. The fragrance is a light floral, not my favorite, but not the worst either. It doesn't linger so that's a plus. I'll definitely be repurchasing this. One bottle has lasted me for nearly 2 months, and I haven't finished it yet. That's with using it twice a day, almost everyday! 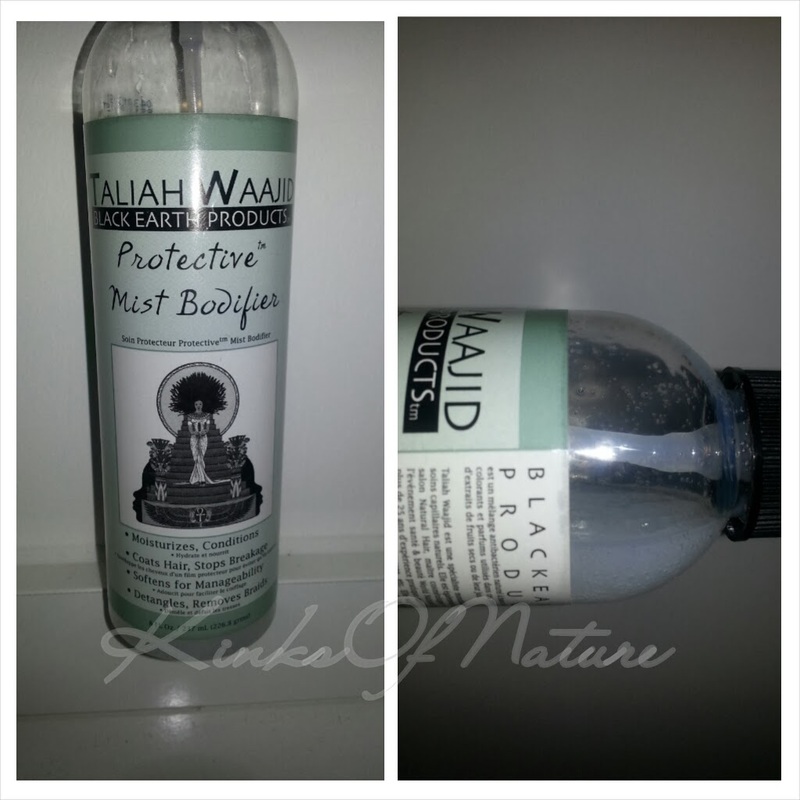 Taliah Waajid Protective Mist Bodifier retails for about $8.00 (USA and Bahamas) and £5.00 (UK) at local beauty supply stores. It is also sold online. 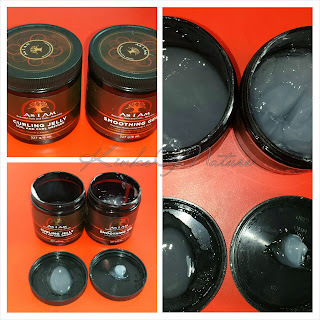 One of the great thing about Taliah Waajid products is that you can find them just about anywhere.